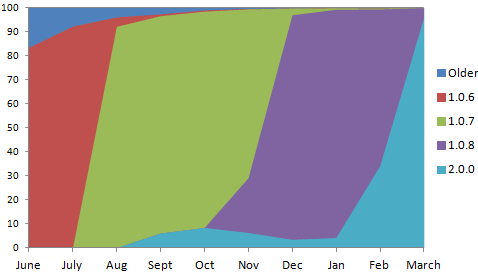 The above chart shows the adoption of each version of the BlackBerry PlayBook for each month since June as seen from downloads of the game Pixelated. Last month saw 95.62% of users running OS 2.0 on the PlayBook. This is despite OS 2.0 launching less then a week before the start of this time frame. At this point you could begin releasing apps that required a minimum OS of 2.0, and it unlikely that anyone would even notice the higher minimum requirements. March also found 5 users playing Pixelated on devices running either OS 10.0.2 or 10.0.3 which is a good reminder that soon even OS 2.0 will be a thing of the past. This data was taken from downloads of the popular PlayBook strategy game Pixelated. Data shown on the chart is from the beginning of June 2011 through the end of March 2012.